Used to block the sunlight from reaching the pond or lake bottom thus starving the bottom growing weeds for necessary UV light required for continued growth. 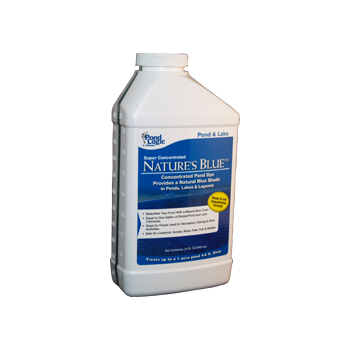 Nature's Blue - Great for ponds and small lakes with natural grasses and plantings around the shore. 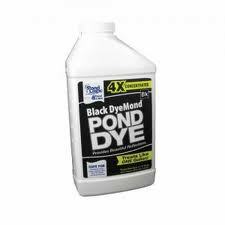 Black DyeMond - Gives your pond a rich appearance and provides beautiful reflections of trees & buildings. Creats a mirror like finish to your pond or lake. Both dyes are food grade and are safe for people, pets, fish, livestock & wildlife. Diluted product will not stain skin, fur, or scales. 00056 One quart is equivalent to one gallon of our competitors dyes to treat the same amount of water!. 530101 One quart is equivalent to one gallon of our competitors dyes to treat the same amount of water!.